The GSM/GPRS (General Packet Radio Service) Shield is a new non voice value added service that delivers GSM/GPRS 850/900/1800/1900MHz performance for voice, SMS, Data, and Fax in a small form factor and with low power consumption. 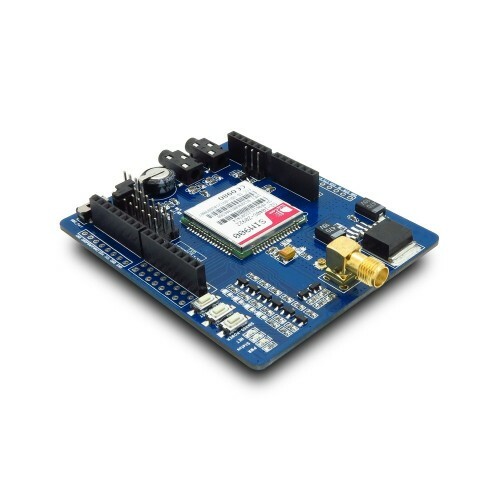 The GSM/GPRS Cellular Shield for Arduino is complete in all respect(ready to plug-in, antenna and its extension included) to interface your Arduino with an SIM900 GSM/GPRS cellular module. This allows you to easily add SMS, GSM/GPRS, and TCP/IP functionalities to your Arduino-based project. All you need to add cellular functionality to your Arduino project is a SIM card (pre-paid or straight from your phone) and you can start sending Serial.print statements to make calls, send texts and serve web pages! It is controlled via AT commands (GSM 07.07 ,07.05 and SIMCOM enhanced AT Commands), and fully compatible with Arduino and Mega, ADK boards.